Occupying the east of the village of Woburn, Bedfordshire, England, is a country house, the family seat of the Duke of Bedford. Although it is still a family home to the current duke, it is open on specified days to visitors, along with the diverse estate surrounding it, including the historic landscape gardens and deer park (by Humphry Repton), as well as more recently added attractions including Woburn Safari Park, a miniature railway and a garden/visitor centre. 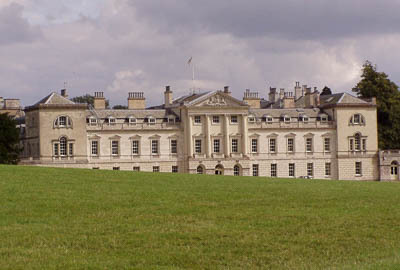 Woburn Abbey, comprising Woburn Park and its buildings, was set out and founded as a Cistercian abbey in 1145. Taken from its monastic residents by Henry VIII and given to John Russell, 1st Earl of Bedford, in 1547, it became the seat of the Russell family and the Dukes of Bedford. The Abbey was largely rebuilt starting in 1744 by the architects Henry Flitcroft and Henry Holland for the 4th Duke. Anna Russell, Duchess of Bedford, originated the afternoon tea ritual in 19th-century England. Main field diamond diapered pattern of brown-olive leaves on a crimson ground. Each diamond contains four 5-petalled flowers (daisies?) in dusky pink. Main border of large diamonds containing four petalled rosettes. Each corner has an eight petalled rosette. Inner three borders separated by dark brown and silver striped guards. Outer border of Corinthian tongues on a brown ground with a narrow buff band outside. Carpet is probably one of a series (of three) made for the Long Gallery. Flowing, Turkish design on a red ground, with a variety of palmettes on a framework of lines and diamonds running the length of the carpet and a gently contrasting wide border also of palmettes. Main field is basically a design of three different palmettes, grouped in eights around the central diamond. This encloses a rosette and is central to the line framework running up the whole carpet. Main border – palmettes and roses alternating, linked with flowing stems and surrounded by leaves, buds and small florets. A wide outer border encloses a main field of two alternating ‘floral’ panels. The main field has a ground of rose coloured myrtle leaves on a dull flame ground. On this, two different panels of very stylised leaves, buds and rosettes are placed alternately, one with a creamy background, the other with gold and browny olives. Main border is scrolling stems and acanthus leaves in pinks and browny olives separating two motifs – a standard rosette and a strange medallion with blue. Inner and outer identical rose-coloured five petalled florets with blue and olive leaves alternating. Enclosed in striped guards.